For the second time in his life, the world as Mr Jason Chee saw it darkened around him this April. This time, as far as his right eye is concerned, it is a darkness that is forever. He has lost the eye that helped him win multiple medals for table tennis at the Asean Para Games (APG). A naval ship accident in 2012 that robbed him of both his legs, his left arm and three fingers on his right hand, did not manage to stop him. Now he is practising again for next month's APG, intoning a simple mantra. "Once a fighter, always a fighter. I'm a fighter," he said. "I still have one eye. I can be happy day by day." The latest storm broke when the navy serviceman felt a sudden partial "blackout" in his vision one morning when he reported for work at Changi Naval Base almost four months ago. The 34-year-old was diagnosed with choroidal melanoma (a cancer of the eye) after a tumour 1.5cm in circumference was found in his right eye. Given that the disease had not spread, doctors advised that removing his eye would be the best way to arrest the cancer. Within a fortnight, he found himself wheeled into the operating theatre once again, about to lose yet another vital and irreplaceable part of his body. I've lost a lot. But life has to go on. Our biggest enemy is ourselves. We must defeat our fears and not be afraid of anything that we think we can't do. I don't want to see myself as a person with disabilities. I want to see myself as a cheerful, normal person. Despite being a self-proclaimed optimist, Mr Chee said he, too, questioned the latest hand he had been dealt. He told The Straits Times yesterday: "I tried to find treatment to save my eye, but there was no way. I was quite down, and wondered why this would happen to me." It was even harder for his elderly father, a 75-year-old retiree and a former vegetable seller, to accept the latest misfortune to befall his only child. 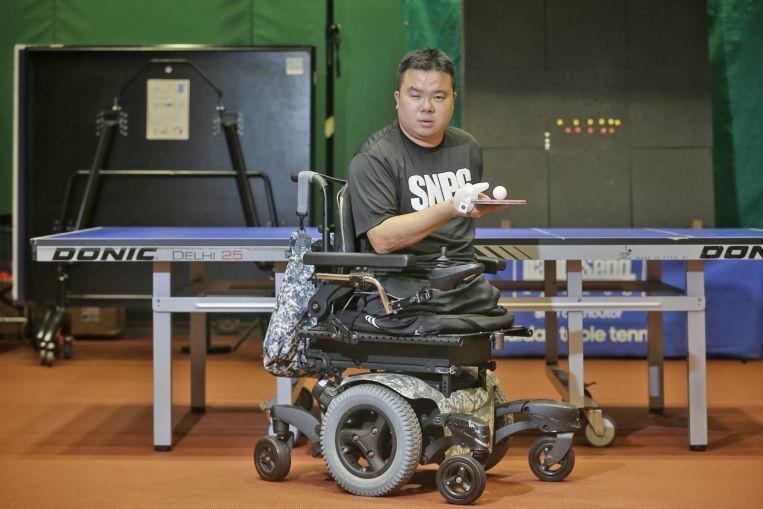 Yet Mr Chee has the toughness of one who has been in the navy for 13 years, and the resilience of an athlete who became a successful national para-table tennis player following his accident. He also had a mother who spent her lifetime teaching him to face adversity head-on, before she died in 2011 of kidney failure at age 65. A day before he checked himself into the hospital for surgery - coincidentally it was Vesak Day - the Buddhist did what his mother would have done: He went to the temple and prayed. Mr Chee, who won a team gold at the 2015 edition of APG on home soil, said: "I can't prevent this from happening to me but I can control how I respond to it." He remained stoic, just as he had through his accident five years ago. There was, however, a considerable amount of adapting to do. Having lost some peripheral vision and depth perception, Mr Chee, who still does household chores and enjoys whipping up dishes like chicken curry, has to be more careful with his movements to avoid falls and injury. Getting ready in the morning now takes an hour, 20 minutes more than before. Picking up the table tennis bat again also required considerable effort. When Mr Chee returned to training in the second week of June, three weeks after surgery, he found himself missing routine shots. He said: "I kept missing, and kept hitting into the net. But my coach (Chia Chong Boon) was very patient with me, everyone was encouraging me, so I told myself I couldn't give up." Rather than believe that life has been unfair, he wants people to see how undeterred he is. By picking himself up time and again, he hopes to inspire others. He said: "Look at me - I've lost a lot. But life has to go on. Our biggest enemy is ourselves. We must defeat our fears and not be afraid of anything that we think we can't do. "I don't want to see myself as a person with disabilities. I want to see myself as a cheerful, normal person." His vision may not be like before, but this man of the seas still views life with admirable clarity.